WordPress automatically saves back up copies or versions of your page or post in a panel called Revisions. Each time you click Save Draft or Update, a revision is saved. UCI Sites stores the last 25 revisions of each page or post allowing you to look back at recent changes and revert back to an earlier version if necessary. If you have saved more than one version of your post or page, WordPress will display a Revisions area in the Publish pane. 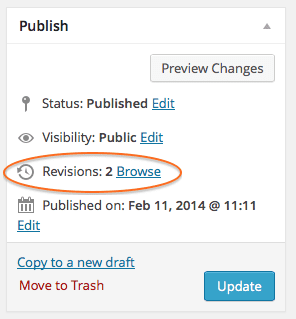 To compare page revisions, click the Browse link next to Revisions. 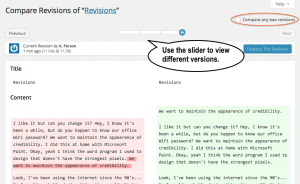 The revisions page now has a slider. You can use this slider to scroll between revisions to see the changes that have been made. 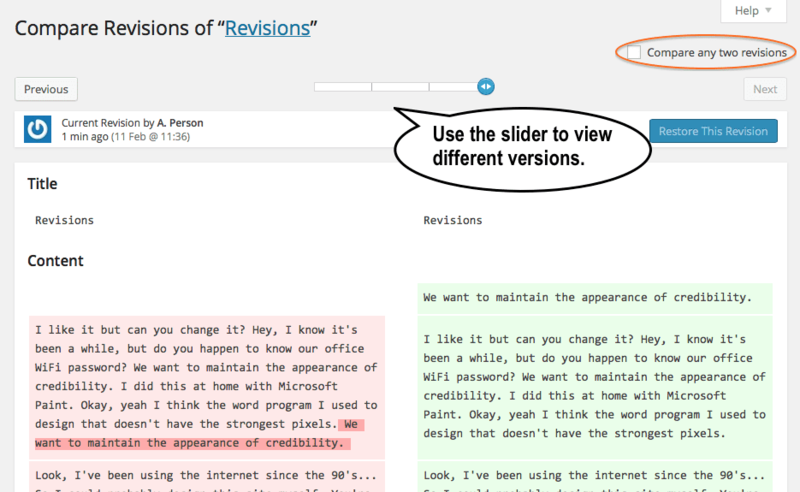 To Compare two revisions, check the box next to Compare any two revisions in the top right. The text of the two versions will be displayed side by side. Changes will be shown in red for the old version and green for the newer version. Click the Restore button when you are on the version you want to make the current version. You may need to uncheck the Compare box. The restored version will now become the current version.